No matter how many there are, Orlando's best coffee shops can get a little crowded now that we're all working all the time, but one downtown spot remains relatively elusive due to being enshrouded in the financial mystique of the Bank of America building. 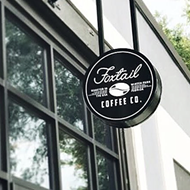 Foxtail Coffee Co. partnered with downtown French brasserie DoveCote to open this jungle library fusion café area on the first floor of the building. Bring your friends for some delicious coffee under the soaring atrium, or keep the secret to yourself and study here quietly until 9 p.m. daily.